This ingenious frame design has been developed to maximise space saving in smaller areas, or where a clutter free environment is required. Designed to sit neatly hidden away behind a drawer front, this system simply pulls out and gives you a choice of table widths. 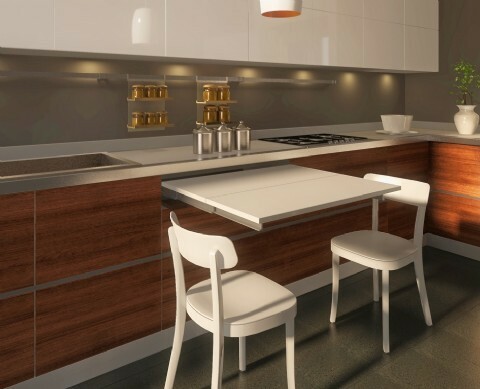 All you need to add is the top of your choice and then you have a versatile tabletop, perfect for small kitchens, kitchenettes, laundry rooms, offices, playrooms and childrens bedrooms. Recent applications have also included mobile homes and caravans. Available in a choice of widths, this system will give you a pull out workable table top area of approx. 750mm in length. There's no need to store extra components, extensions etc. elsewhere as everything is compactly designed within the drawer ready for you to simply open the hinged front of the drawer space. Sales suggested I submit a request for a CAD drawing from the european manufacturer through the website. Hope you can help!